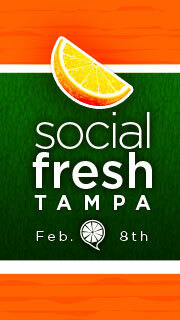 Social Fresh Makes its Way to Tampa! So many events, so little time! In addition to the great lineup of Tampa Bay area events we have lined up for January, we have plenty more coming in the month of February. So to kick off the month, our friends over at the Doubletree Hotel Tampa Westshore Airport, bring you Social Fresh Tampa! Now for those of you that are not familiar with, please let me explain! Social Fresh is a social media event planning and training company based out of Charlotte, NC. Social Fresh was founded by Jason Keath, who does social media consulting for mid to large companies. This is a great event for experienced Social Media users in addition to those who are looking to find out more about Social Media and how it can help their business or organization. This Social Fresh event will be the second event of 2010. In addition to being a warm Florida destination (well not with the recent weather we&apos;ve been having) Tampa is without question a marketing hot bed for Social Media marketing. The content and programming will reflect all Social Fresh flagship events with big brands and real social media success stories, all specifically for marketing professionals. Believe me folks when I say that this lineup of speakers if a group of powerhouses, and one of the best speaker lineups you will see anywhere. If you don&apos;t believe me, then check out the list for yourself! It&apos;s pretty much a who&apos;s who of big Brand and Agency Social Media gurus, so you had better start registering and reserving your hotels! Jerm is going to try his best to make it, so I hope to see everyone else there! That&apos;s all for now, but be sure to stay tuned in for more updates as we draw closer to the event! Check back with me soon for more updates on events in the Westshore district!